S.T.Dupont Neptune Line 2 limited edition lighter is dedicated to Neptune, the Roman god of freshwater and the sea, creator of horses and owner of a powerful weapon, the Trident. 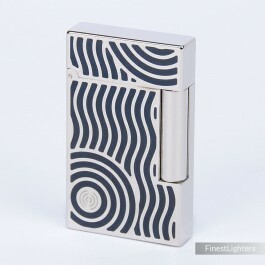 The lighter is finished in polished palladium (platinum) and is decorated with navy blue Chinese lacquer waves, representing the vibration of the sea. Only 888 individually numbered lighters were made in 2010 (very rare). A great limited edition lighter, completely sold out.